Picturesque and private setting, tucked at the end of a shell lane, this ‘Sankaty’ style home in the award winning community of Nashaquisset offers everything for summer enjoyment or year round easy living. Extra features include first floor master suite, central air conditioning, a sunny breakfast room, plus a sun room with vaulted ceilings. The bonus is the professionally landscaped yard with southern exposure abuts acres of protected Land Bank land. Just a mile from Town and off of the Surfside Bike Path. Strong rental income potential, full landscaping services, on-site management, pool, and tennis. Your own country club without leaving your neighborhood. Completely renovated (inside and outside) Federal Style Nashaquisset Property with 2,122 square feet of upgraded living space. 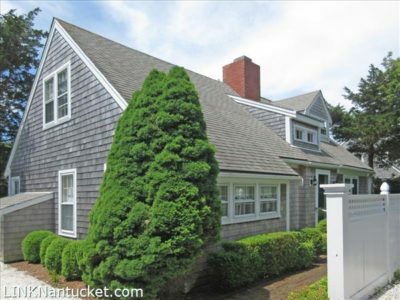 Tucked away on ..
Pristine home in the nationally recognized community of Nashaquisset. Being offered fully furnished with the highest quality custom pieces throughout. ..
Carefree living in beautiful award winning Nashaquisset. Charming home with welcoming front porch, open concept main floor with desirable first ..
Pristine ‘Gardner Street’ style home in the nationally recognized community of Nashaquisset. Three full levels of living in a stunning ..